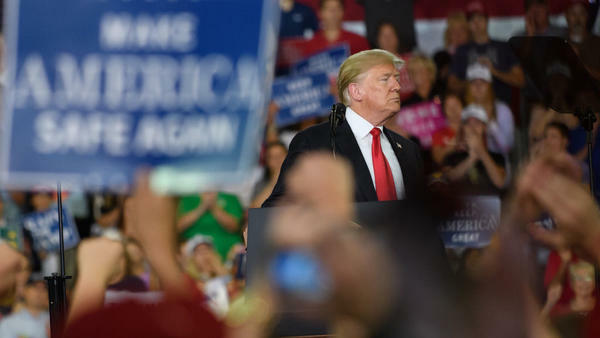 President Trump speaks to supporters at a rally Wednesday in Erie, Pa.
President Trump warned at his rally in Pennsylvania on Wednesday night that if his party loses in November's midterm elections, the "radical Democrat mob" will take away everything he has achieved since his election, while encouraging crime and socialism. It was an echo of something he's been saying a lot lately, including at rallies in Iowa and Kansas in recent days and on Twitter — a line that Republicans have been quick to seize upon as they try to sustain a newly-enthused GOP base in the wake of the divisive confirmation battle for Supreme Court Justice Brett Kavanaugh. "You don't hand matches to an arsonist, and you don't give power to an angry left-wing mob. Democrats have become too EXTREME and TOO DANGEROUS to govern," Trump tweeted Saturday. "Republicans believe in the rule of law - not the rule of the mob. VOTE REPUBLICAN!" Republicans argue top Democrats have only been fueling that characterization, signaling lately that they won't abide by the mantra that former first lady Michelle Obama famously used in the 2016 campaign — "when they go low, we go high." "When they go low, we kick them. That's what this new Democratic Party is about," former Attorney General Eric Holder said over the weekend while campaigning in Georgia. "We're proud as hell to be Democrats. We're going to fight for the ideals of the Democratic Party." Holder, who's mulling a 2020 presidential bid, later clarified that he wasn't advocating for outright violence. "When I say we, you know, 'we kick 'em,' I don't mean we do anything inappropriate. We don't do anything illegal," said Holder. "But we got to be tough, and we have to fight for the very things that [civil rights leaders] John Lewis, Martin Luther King, Whitney Young – you know, all those folks gave to us." And 2016 Democratic presidential nominee Hillary Clinton also had harsh words for the GOP in an interview with CNN on Tuesday, saying, "You cannot be civil with a political party that wants to destroy what you stand for, what you care about." "That's why I believe, if we are fortunate enough to win back the House and or the Senate, that's when civility can start again. But until then, the only thing that the Republicans seem to recognize and respect is strength," Clinton said. She bemoaned the treatment of the woman who accused Kavanaugh of sexual assault, Christine Blasey Ford, whom Trump openly mocked at a rally last week. Republicans have used Clinton and Holder's remarks as further justification for their "mob" characterization and the suggestion of violence or any confrontation in very personal ways, describing threats they received after they voted for Kavanaugh. Colorado Sen. Cory Gardner, who chairs the National Republican Senatorial Committee tasked with protecting the GOP's Senate majority this cycle, tweeted Wednesday, "Just before I voted to confirm Justice Kavanaugh, my wife received a text message of a graphic beheading. We now have public officials saying you should be uncivil to each other - a call for incivility....We have our political disagreements and we should cherish the rights to express our disagreements. But when it comes to calls for violence and attempted murder and assassinations this country has gone too far and it's time we step back from that brink." Kelley Paul, the wife of Kentucky Republican Sen. Rand Paul, released a letter via CNN to New Jersey Democratic Sen. Cory Booker about how fearful she was after her family's home address and information was posted during the Kavanaugh debate. "Earlier this week, Rand was besieged in the airport by activists 'getting up in his face,' as you, Senator Booker, encouraged them to do a few months ago. Preventing someone from moving forward, thrusting your middle finger in their face, screaming vitriol — is this the way to express concern or enact change? Or does it only incite unstable people to violence, making them feel that assaulting a person is somehow politically justifiable?" Kelley Paul asked. Frank Luntz, a Republican pollster and messaging guru, said that the "angry mob" description was apt and that he had told GOP candidates to use it when talking about protesters and those who opposed Kavanaugh in the wake of sexual assault accusations and testimony from Ford. "It is essential that [senators] are authentic and that they are accurate in their communication. When you see the video, that is exactly what it is," Luntz said. "I have advised them not to overstate, but when you have videos of people chasing after senators and screaming at them, it really is an angry mob. It is accurate and it accurately describes what happens." Luntz said it wasn't necessarily a "turn-out mechanism," but was simply "a description of what happened." GOP strategist Ken Spain, who was communications director for the National Republican Congressional Committee in 2010 when his party won back the House, said he thinks use of that term will escalate even more over the next month as Republicans try to sustain the enthusiasm bump they got in the wake of the Kavanaugh fight. "The Kavanaugh debate clearly fueled Republican intensity over the course of the last few weeks. The question is whether that can be sustained in the final month of the election. Four weeks is an eternity in campaign politics, so Republicans are likely looking for a way to maintain the existing intensity level," Spain said. Meanwhile, some endangered Democrats are eschewing the pushback that Holder and Clinton are calling for. North Dakota Sen. Heidi Heitkamp said on CNN that Clinton's comments were "ridiculous. ... I mean I can't imagine how you get anything done if you don't bring civility back into politics, and that goes for both sides." However, Lawrence Jacobs, director of the Center for the Study of Politics and Governance at the University of Minnesota, said what Republicans are pointing to, such as the protesters in the Capitol during and after Kavanaugh's confirmation, weren't really unruly mobs. "There were protesters in the Capitol who were making their voices heard, which is protected by the U.S. Constitution and something Republicans do all the time. That's hardly something I would describe as a mob. I would describe that as noisy democracy," Jacobs said. And, Jacobs added, such strong language to appeal to your base is nothing new in American history. "The specific language about mobs and lawlessness and chaos is something we heard from Republicans in the 1960s and 1970s. Some of it was in response to riots in cities. Republicans put a spotlight on it and used it as a way to say that Democrats were soft on crime, that they were encouraging chaos. It was very effective in the hands of Richard Nixon," he recalled. "It speaks to this idea of insecurity, of anxiety, that we are at the point of this shift in our country. For Donald Trump's core base, this is something he has skillfully mined for support." Could that rhetoric work? In parts of the country — particularly deep red states that Democrats are defending in the battle for the Senate — it could. But, as Republicans struggle to hold onto the House — which is in danger of flipping in large part because of energized female voters in suburban districts that have turned on Trump — it could have an adverse effect. "It will work in some parts of the country. I think of these red states where Democrats had shown some promise like Tennessee and Texas. ... I think it is going to bring out Republicans," Jacobs said. "On the other hand, there are parts of the country where you have competitive districts, you're going to see a high turnout among Democrats. I think what the president has done is energize women. I think it's going to be a mixed bag." NPR's Domenico Montanaro contributed to this story.